Last weekend I gave a two-day seminar at the Staley Performance Institute in Phoenix, AZ. During the seminar I talked extensively about the importance of training with gymnast rings for upper body and core development. The muscle-up represents one of the five essential rings exercises that every power athlete should do. However, it’s often too advanced at first so I explained how to break down the exercise into its components. My instruction starts with the false grip pull-up. Mastering the false grip pull-up is the first, and most difficult, step toward achieving a powerful muscle-up. Most guys have trouble with a muscle-up because they don’t have the strength to pull a fast pull-up with a false grip, especially from the full hang position. So let’s do a quick overview of the wrist positions for the rings. 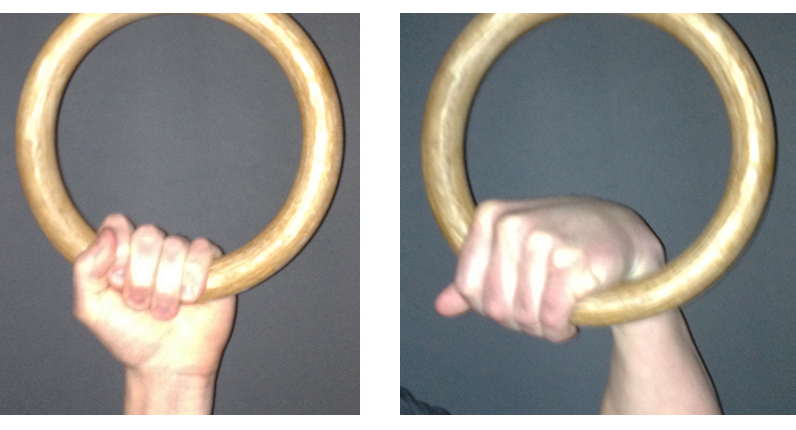 The picture on the left shows the normal wrist position when doing a regular pull-up from rings. This is the strongest and most comfortable position for the wrist. The picture on the right shows the false grip – the grip that makes you instantly feel as weak as a malnourished marathon runner. The purpose of the false grip is to elevate your wrist so it’s the same height as the bottom of the rings. Without this wrist elevation it’s virtually impossible to rotate your hands and continue into a dip. When a guy attempts to hang from the rings with a false grip he usually can’t fully straighten his arms, much less pull with any significant strength. It’s definitely an uncomfortable wrist position at first. But like any exercise, you’ll get stronger and your range of motion will quickly increase if you practice it. Before you attempt a false grip pull-up, it’s essential to have the right rings. The only kind of rings worth buying are made of wood. Plastic, metal or rubber coated rings are too slippery, especially when your hands start sweating. Wood absorbs sweat and is easier to grip. Also, chalk is necessary to keep a rigid wrist position. My favorite rings for the money are from Christian’s Fitness Factory. It’s the best $82 you’ll ever spend. You can get their wooden rings by clicking this link CFF Wooden Rings. Now let’s move on to the false grip pull-up. Here’s how you do it. Starting position: establish a strong false grip and hang with your arms straight, or as straight as you can initially muster, with your legs straight and held in front at a downward angle. This position engages your abs and puts your body at the correct angle to mimic the first part of a muscle-up. The pull: pull your body as high as possible while keeping your legs in front at a downward angle. The goal is to get to the point where your chin is a few inches above your knuckles, as shown in the picture below. Don’t worry about pulling fast, this is a slower, high tension strength exercise. Plus, it’s easy to lose the false grip if you go too fast at first. Look closely at my wrist position in the pictures so you know you’re doing it correctly. I’m leaning back as I pull up to the top position because that body angle is necessary to flip your hands, thrust your hips back, and continue into a dip for a muscle-up. Leaning slightly back as you pull up ensures that you’re training the correct initial movement pattern to carryover to a muscle-up. Lowering phase: the first time you attempt to lower your body into the full hang you’ll probably lose the false grip. The key, again, is to use chalk. Also, lower slowly and concentrate on your wrist position. With a little practice you’ll get the hang of it. Perform the false grip pull-up for 5 sets of as many reps as possible 2-3 times per week. Once you can perform five full range of motion reps you’ve developed sufficient pulling strength for the first half of a muscle-up. Hey,thanks for the article! I have a some questions 🙂 I find it hard to do the chin ups and dips fast from rings, will I still activate all the motor units even though I am doing it rather slow? Can you use the chest muscles as stabilizers in back exercises like when you use your back when you do chest exercises? My brother and I are thinking about importing nuts, and starting a small company, since they are really expensive where we live and the demand is fairly high. Do you have any suggestions as to which other than almonds? CW: Remember, there’s more than one way to recruit all your motor units. High tension exercises on the rings will do it. Rings exercises aren’t supposed to be fast. For nuts, macadamia, brazil, walnuts, cashews, etc are all good. CW: Do rings exercises 3x/week and eliminate your upper body heavy lifting. Thank you for your great articles all the time! One quick question: I am doing currently a high frequency pull-up program. I can do 22 pulls straight. Is my targeted every-day-volume of 100 reps total enough or should I go up or take a weight vest? CW: 100 reps is plenty. If you add a vest to daily pull-ups you’ll probably burn out unless you drop the volume to 40 or so. CW: You probably need to stretch your wrists and shoulders so start doing that each day. Great article, I have been trying to nail one of these since November. If I remember correctly, you’ve mentioned a program you will be releasing incorporating extensive ring work. I’ve had the rings for two months now and really haven’t found anything that incorporates them with a S&C routine so I’m looking forward to this. Any word on a release date? CW: With any luck it will be out in a month. The rings were the most fun. A great seminar Chad, thanks for taking the time to help us all really get it! CW: My pleasure Roland, great having you there. Thanks for the clarification. One of your previous articles addressed using the false grip and showed a picture as an example. It’s different than the traditional “false” grip used on barbells, but I had a general idea. Santa brought me a pair of CFF rings for Xmas per your recommendation 🙂 So far I’ve been dedicating one upper body day out of my 4 day split to ring work (weighted pull ups, weighted dips, one arm inv rows, weighted push ups–with front levers, L sits in between sets). My next sesh is going to have both upper body days dedicated to ring work. I love them—they’re a totally different beast and my shoulders and joints feel great! Whens your next project coming out? CW: Great. Next program hopefully out in March. Hi Chad, I was wondering if there are other benefits to using the false grip for pullups other than preparing you to do the muscle-up? Thanks. CW: Yes, good question. The FG pull-up will train you to better engage your lats with pull-ups. Would you recommend a brand of gymnist rings that you could hang from a power rack? CW: You can hang those rings from a power rack. Great explanation and advice for developing the false grip. I’m working progressions for muscle ups on straight bars, but also want to be able to do them on the rings. I’ll definitely incorporate the false grip pull-ups into my ring training day so I can start getting the hang of it. I’ve done them in the past and feel like it will take a little bit of time for your wrists to adapt to this movement. I have thin wrists so this is probably a factor as well. After reading your articles I got those very same rings and they are great, however where is it best to have the grip, in the middle, the curve farther out to the body or closer in? Also on the pic to the left that for pulls it was best hold hold the middle of the ring. I might be mistaken, please correct me, but I thought it was better to hold the rings slightly towards the outside curve to recruit more lats, and slightly inwards for chins. I am pretty sure you touched on this subject in Huge In A Hurry which I read, a few weeks ago, but a buddy of mine has it right now, and since muscle ups came up, seems perfect to get all the grips down. CW: Hold the grip wherever it feels most comfortable. Thanks so much for this post! I’ve been trying to get a muscle-up on rings for months now and it was this post that finally made it click for me (slower pull speed and body lean). Yesterday I was finally able to get 3X1 muscle-ups. Am going to work now on multiple reps. Any tips for not losing the false grip on the descent? I’m 230lbs so I imagine it’ll just be a case of more practice to lower under control. Also wanted to mention that for those who mistakenly purchased plastic rings (as I did, before knowing the wood ones were better), wrapping them in hockey tape is a decent way to improve grip for this exercise. CW: Use chalk and just work on maintaing that firm false grip with a slow lowering phase. Good tip about taping the plastic rings.